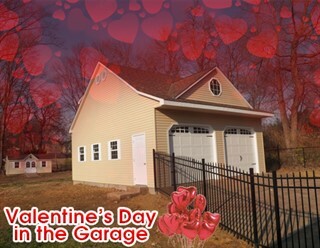 Care for and love your garage door—it is a major part of your home, and you likely use it every single day. Valentine’s Day is characterized by showing your appreciation for your special person, but it can be more than that. Taking the time to look after your garage door can be just as much about doing yourself a favor as it is about completing a chore, and does not have to take very long. Garage door maintenance starts with inspecting the door. Look for rust and cracks in particular. See if the paint is chipped, or if any of the panels are damaged or bent. Open and close the door, and listen for any rattling or straining—and figure out where it comes from if there is any. All moving parts of the door and the automatic opener are subject to loosening or drying up, especially with heavy use. Check that the opener sensors are not damaged, scratched or blocked. Once you have concluded whether any parts of your door require repairs, move on to tightening bolts and screws, and lubricating the moving parts. Door hinges, tracks and so forth all require a couple drops of oil in order to operate smoothly. An added bonus of doing this is less noise when opening and closing, and a longer lifespan of the setup. When all of the parts on the inside of the garage have been inspected and dealt with, it is time to make the front presentable. Use simple water and soap to wash off any stains. This will also provide you with a clean surface to apply decorations to. Make sure to dry the door thoroughly once the wash is finished. Depending on the material of your door, some soaps may be more suitable than others—read the label on the soap to find out what materials it is suited for. Your garage door is well cared for and clean, and you can start thinking about any decorations you may want to put up for the season. Stickers, magnets, and ribbons are all simple choices which require some creativity but little time. These forms of decorations are also unlikely to cause any issues with opening or closing the door, but do so as you are decorating it to make sure. Now get ready to show off the door to anyone passing by, family, friends, or that special someone, and wish them all a happy Valentine’s Day.